Egypt Muslim Brotherhood leader Mohammed Badie held The spiritual leader of the Muslim Brotherhood, General Guide Mohammed Badie, has been arrested in Cairo, Egyptian officials say. "> The spiritual leader of the Muslim Brotherhood, General Guide Mohammed Badie, has been arrested in Cairo, Egyptian officials say. 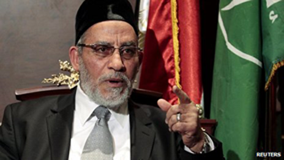 Mr Badie had been on the run as interim authorities in Egypt try to suppress Brotherhood protests at the ousting of President Mohammed Morsi. His arrest comes days after his son, Ammar Badie, was shot dead during protests in the capital's Ramses Square.